Do you play the Paperclip? If you're in France and ask someone for a trombone, don't be surprised if they give you a paperclip instead of a brass instrument. You see, the French word for paperclip is trombone and if you look at their similar shapes you can see how this happened. 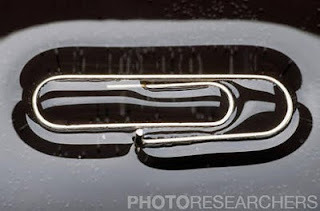 So a bit of travel advice for musicians, or administrative types, when in a Francophonic country, be clear as to whether you'd like to play a jazz tune or need to hold together a a bunch of paper.2Z9853 © Charles D. Winters / Photo Researchers, Inc.
Take a look at our Paperclip and trombone picture. © Guy Gillette / Photo Researchers, Inc. The group of synthetic polymers commonly know as Nylon were patented on this day in 1937 by Wallace H. Carothers and the DuPont Corporation. Nylon is best known as a replacement for silk stockings during World War II. It also played an important role in military parachutes, flak jacket and surprisingly in tires. Originally intended mainly as a substitute for silk, Nylon is now used in millions of items, from sleeping bags, cooking utensils, sails, ropes, luggage, life jackets, bridal veils, mascara brushes, carpets...the list goes on and on.It's pretty fascinating stuff! Learn more about nylon from this collection of science stock photos. © Charles D. Winters / Photo Researchers, Inc. Happy Birthday, Daniel Bernoulli (Dutch-Swiss mathematician b. 1700). Ever idly looked out the window on a long flight and wondered how a huge, heavy airplane is really able to FLY that far above the ground? 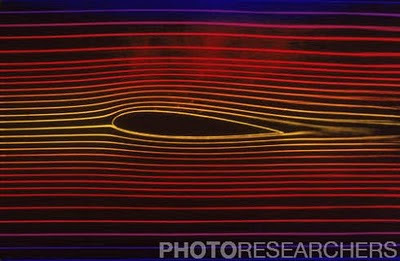 Photo Credit: Omikron / Photo Researchers, Inc.